By Timoleon - Sister to Tuckahoe by (Ball's) Florizel. While his grandsire, Sir Archy is considered the first great stallion bred in America, Boston is generally hailed as America's first great racehorse. His exploits on the race course, and later as the sire of the great stallion Lexington, mark him as one of the most important figures in racing in the 1800s. Timoleon, from whom Boston inherited his stride and action. Timoleon, one of the better racing sons of Sir Archy, was standing in Charles City County, Virginia. John Wickham sent his mare, a sister to the good horse Tuckahoe (by Ball's Florizel), to be bred to him. The next spring, the Sister to Tuckahoe foaled a blaze-faced chestnut colt at Wickham's plantation in Henrico County, Virginia. Since both Sir Archy and Ball's Florizel were sons of *Diomed, the resulting foal was inbred 3x3 to *Diomed. The story goes that in 1835, Wickham was playing a high stakes game of cards with Richmond, Virginia resident Nathaniel Rives and lost. To pay off his $800 debt, Wickham gave Rives the fiery red Timoleon colt, now a 2-year-old. The colt was named Boston, after a popular card game, possibly to commemorate the play that brought him into the Rives' stable. Rives' trainer was John Belcher, a trainer for racing mogul Col. William R. Johnson, and he was probably not the first to have discovered Boston's troubling disposition. Still, he managed to break him to saddle, despite advice of fellow horseman Col. L. White who recommended that the chestnut colt be "either castrated or shot, preferably the latter." A particularly daunting habit of rolling with a rider up (or down) was finally countered when trainer and grooms leaped aboard Boston while he was down, and beat him into submission. Problem solved. Boston started for the first time in April of his 3-year-old year but the quirky colt refused to finish the race after appearing a sure winner. Arthur Taylor took over his training that year (1836), and Boston returned in the fall to win 2 races at the Petersburg and Hanover Court House courses, beginning a 17-race streak that lasted into his sixth year. Boston came to dominate the best of racing from the age of 4 through 10. He raced in Col. Johnson's colors starting as a 4-year-old, under the guidance of the famed jockey Cornelius, a slave owned by Johnson. That year, the red devil went undefeated in 4 contests. In 1838, as a 5-year-old, Boston won all of his 11 races in a grueling campaign of 4-mile heat racing that took him up and down the East Coast. He started the season at the Union Course on Long Island (New York), and traveled to Hoboken for New Jersey's Beacon Course, to the course at Camden, back to the Union Course (running the first 3 miles in record time, and the second best 4 miles ever recorded in America), and back to Hoboken again. That was the spring campaign. In the fall, he won at Petersburg, Virginia, Baltimore, Camden, Long Island, and Hoboken in quick succession. Johnson sold a half-interest in Boston sold to James Long, a resident of Washington D.C., in May of 1839. That year, as a 6-year-old, Boston ran 9 times, winning 8. His only loss came in April at Petersburg, in one of the first races of the season, when Boston was said to be "off balance." He returned at the Broad Rock, Virginia course to run 3 miles in a new record time. At this point, his rider was changed from Johnson's Cornelius to the famed white rider Gilpatrick. At 7, Boston was undefeated in 7 races. At 8, in 1841, with his spring and fall campaigns broken up with a summer spent covering mares, Boston's invincible luster began to fade. That year, he was nearly beaten by Mariner in 4-mile heats at Baltimore, and the next week at Camden, was distanced in the first heat by Mariner's half-sister, Fashion (4 years his younger) in the Jockey Club Purse. In 1842, at the age of 9, he raced 5 times, winning 3. The highlight of the season came on May 10 at the Union Course, one of the famous North-South matches, this one a return bout between Boston and Fashion, $20,000 a side over 4-mile heats. Boston rapped his hip and yielded the first heat to the mare. She distanced him in the second heat, so the injury may have been worse than it appeared, however Fashion was on her top game - in the process of victory, she had set a new American record of 7:32 1/2 for a 4-mile heat. Boston returned 3 days later and held off Mariner in a desperate finish. He ran once more, then took the summer off from racing, breeding his second season of mares. The old campaigner returned for 1 more race as a 10-year-old, won it, and retired for good. His record of 40 wins in 45 starts, earning $51,700 racing almost exclusively in 3 and 4-mile heats, was a remarkable testament to his brilliant speed, outstanding stamina, and tremendous constitution. In full retirement, Boston covered mares in Hanover County, Virginia from 1843 to 1845. In 1846 he was moved to Washington D.C. and the following winter was walked across Virginia, over the mountains into Kentucky, where he took up residence at Col. Edward Blackburn's "Equiria" at Spring Station (the present day Hurstland/Nuckols Farm property in Midway). 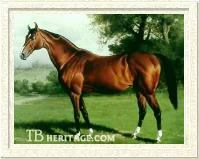 Lexington, a champion racehorse and leading sire in the U.S. sixteen times. 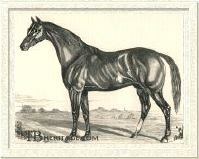 Lecomte was second only to Lexington on the track, and was grandsire of Mannie Gray, the dam of Domino. Nina, a good race mare and producer of many celebrity offspring. Permission granted by the National Museum of Racing. One of the products of his first season at stud was RINGGOLD, a foal of 1842, out of Flirtilla Jr. by Sir Archy. Ringgold was an outstanding runner and became a useful sire, getting Tipperary (sire of Belmont Stakes winner Calvin), Sallie Watson, and Ringmaster. His appearance in the late 1840s ensured that Boston got some high quality mares in his last few years at stud. 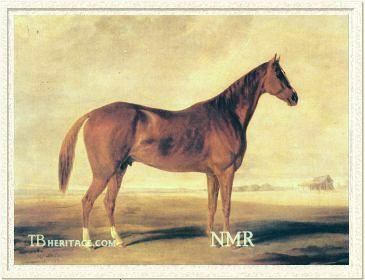 Boston's 1846 crop heralded even greater things, as it included the colts COMMODORE (out of Rosalie Somers by Sir Charles) and Red Eye (out of Lucy Long by *Priam). Commodore also became a good sire, getting Lady Hardaway and Nellie Gray. Other good runners by Boston were ARROW, WADE HAMPTON, ARLINGTON, ZERO, and CRACKER, making him the Leading Sire in 1851, 1852, and 1853. He was second to *Glencoe in 1854. He had become blind in his last few years, and in 1849, was crippled to the point that he had difficulty getting to his feet. All those hard miles of campaigning had finally taken their toll and Boston died in January of 1850, old before his time at the age of 16, when his first foals were just showing their mettle. He was buried on the Blackburn Farm. Boston also sired 2 important fillies, NINA and MADELINE. 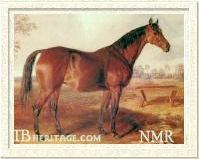 Nina (1848 out of *Frolicsome Fanny by Lottery) was a top racemare, her sire's best daughter on the track, who won races in Charleston, Virginia and Georgia at distances between two and four miles, before breaking down in her last race in Georgia. She produced the champion Planet and Belmont Stakes winner Algerine, her last foal at age 25, in a long productive career as a broodmare. Her daughter Ecliptic was also a prolific broodmare. Madeline (1849 out of Magnolia by *Glencoe) was the dam of Aristides Welch's great matron Maggie B.B., dam herself of Derby winner and Leading Sire Iroquois, Belmont Stakes winner Panique, Preakness winner Harold and the broodmare Jaconet (dam of champion and leading sire Sir Dixon). 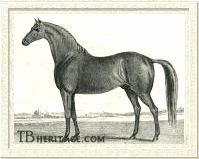 Boston also had an important impact on the American Standardbred; his daughter SALLY RUSSELL (1850) was the grandam of the great trotter Maud S.; his grandaughter, through Lexington, Twilight, was second dam of the fast trotter Jay-Eye-See, and is seen in other harness horse pedigrees, including that of the champion stallion Spencer Scott. The champion trotter Greyhound goes back through tail-female to a daughter of Boston, Jr. (1850). Boston's nickname while racing was "Old Whitenose," due to his conspicuous white blaze that ended in large snip between his nostrils. He also had white stockings behind, and tended to throw flashy offspring like himself, of which Lexington (bay, blaze, 4 white feet) and Lecomte (stripe, snip, hind stocking) were typical. Although not considered particularly handsome, in fact, a little common about the head, Boston was tremendously strong and inspiring in appearance. Standing 15 and a half hands, he had an excellent shoulder which sloped into a strong back and barrel of great depth, reinforced by an immense hindquarter and powerful hindlegs. He had a long forearm and gaskin with short cannons, and excellent pasterns and feet. He was said to stride 26 feet, and excelled over any surface, including mud. Of course, his rotten temperament became legend. Boston passed on his great strength, soundness, speed, and flair for drama to his greatest offspring. It's through Lexington, LeComte, Madeline, and Nina that the blood of Old Whitenose changed the course of American breeding and racing.